I don’t plan on doing a lot of “book plugs” here, but I strongly encourage anyone who wants to learn about missional communities to read Saturate: Being Disciples of Jesus in the Everyday Stuff of Life by Jeff Vanderstelt. Jeff was the founding pastor of Soma, a missional community church in Tacoma, Washington, and is a huge inspiration for us with church planting. Jeff and Soma have been experimenting with missional communities for quite a while now, and this book contains a lot of stories and insights from their history. I first met Jeff and the Soma team through Future Travelers, a traveling learning cohort hosted by Exponential and Alan Hirsch. Tacoma was our second stop, and Soma was the first church I ever encountered that was more missional communities that are a church than church that has missional communities. Jeff had been a youth pastor for Willow Creek – about as big of a youth ministry gig as there is. However, he felt unsatisfied with how young Christians moved on to real/grown-up church and effectively stalled out as disciples. The success of Soma is a major source of encouragement for me. They have grown from a single missional community to a much wider network, but most importantly they have troubleshooted a lot of the tricky parts of trying to nurture successful missional communities. They offer residencies and educational programs, and this book is the first major written resource to come out of their experience. 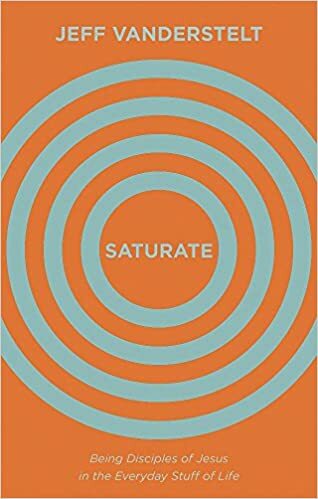 Saturate is a terrific introduction to their story and philosophy of ministry. It’s a really easy read with lots of engaging stories and biblical examples. It also includes a sample missional community covenant (the community-authored expression of its purpose and plan, one year at a time), which helps give a good picture of what “mission” means in missional community. I was sad that the book didn’t have more nuts and bolts information, but that’s not really the point.